First, the magazine suppose to be delivered by 7/01. It got delivered in 7/03. Secondly it came with a scratch. Looks like someone tried to look what was inside, made a scratch on the left side of the package and sadly the magazine was damage. Item in great shape...Like new! 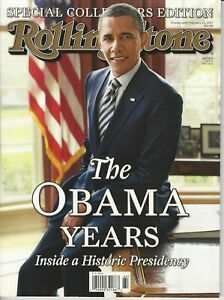 I enjoyed the article on President Obama 8 yearsbin office. It was truly educational and a great keepsake.